SnapBackTM is a recovery beverage that significantly reduces the symptoms of a hangover following a night of drinking. SnapBackTM contains a proprietary blend of natural active ingredients. It is Canada's first scientifically formulated hangover prevention. SnapBackTM is the result of research and engineering spanning two years dedicated to determining the effects of alcohol on the body following a night out.The research investigated factors ranging from dehydration recovery to natural methods of alcohol breakdown. The data was carefully analyzed and a formula was developed with leading industry professionals. The result is a drink that works to give your body exactly what it needs to recover, allowing you to wake up ready to be productive. 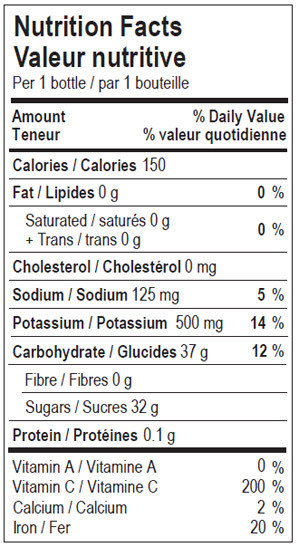 Nutritional Information * Includes proprietary blend of natural active ingredients. Subscribe to SnapBackTM and get the latest on news and events. © 2012 EngBev Ltd. All rights reserved. SnapBack, "After Bar Beverage", and the droplet design are registered trademarks of EngBev Ltd.